This is our most popular jar for both personal use and gift giving for all those special occasions. It is the size most shared with friends and family. Our 8-ounce jar gives you a generous amount of Corium 21 aloe vera cream. 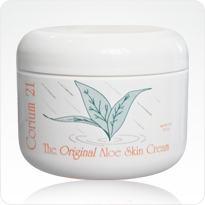 Thousands of our customers over the last ten-plus years use Corium 21 simply because it helps keep their skin silky smooth. Your satisfaction is assured by our 100% money-back guarantee.